Richard O’Brien is a long term donor to Starship who “gave up” his 70th birthday to fundraise for Starship five years ago, raising $32,000 for our national children’s hospital by asking family, friends and fans to donate money to Starship in lieu of getting him a birthday gift. He’s doing it all again this year, holding a “75 Years of Frock ‘n’ Roll” fundraising event in celebration of his 75th birthday, which also coincides with Starship’s own 25 year celebrations. Inspired by Richard, the team at the Starship Foundation decided to create a campaign called ‘My Birthday for Starship’ to challenge other New Zealanders young and old to give up their birthdays for Starship. This is part of a year-long calendar of activities to commemorate and celebrate the hospital’s 25th year in service. Anyone can sign up to be a Starship Star and celebrate their birthday milestone by asking their friends and family to donate to Starship. Instead of receiving gifts, they will be paying it forward to help ill and injured children from all over New Zealand. Birthday fundraisers can set up their own own celebration page by clicking the 'Start Fundraising' button on www.everydayhero.co.nz/event/birthdayforstarship, then invite their friends and family to make a donation to Starship in celebration of them. Starship is New Zealand’s national children’s hospital. There are nearly 130,000 patient visits to Starship Children’s Health each year by children from all over New Zealand. 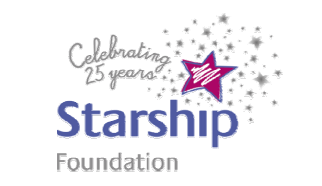 The Starship Foundation is a charity that raises funds so Starship Child Health can better care for its young patients. The Starship Foundation’s vision is to create meaningful and magical opportunities that enrich the health of every young New Zealander. The Starship Foundation raises up to $10 million a year. Donations are extra to Government funding and provide for initiatives such as Starship’s National Air Ambulance Service which brings children from all over New Zealand to Starship for life-saving care, as well as refurbishing older wards, new technology and medical equipment, vital research, boosted family support, staff training and community outreach projects to keep children out of hospital. Starship is celebrating its silver anniversary throughout 2017, with Friday 18th November 2016 marking 25 years since the national children’s hospital was officially opened on that date in 1991. The celebration will run for a year starting on the 18th November and the Starship Foundation urges all New Zealanders who have been touched by Starship to celebrate the milestone. A dedicated on-line destination - www.starshipbirthday.co.nz – is a guide to Starship’s silver anniversary including information, stories, competitions, fun social media activities and events. The site will feature an on-line storyboard called the Wonderwall, showcasing Starship stories from across the past 25 years. We will transport you back to the beginning of our national children’s hospital and step through the years bringing you inside stories about Starship’s courageous patients, hard-working staff, stellar supporters, unsung volunteers, incredible healthcare advancements and so much more. Brad Clark, Starship Foundation Chief Executive is encouraging people to celebrate Starship’s birthday with the gift of giving. “It is hard to find someone in New Zealand whose life hasn’t been touched by Starship in some way – whether through family, friends, colleagues or even just hearing heartfelt stories in the community of children in Starship’s care,” says Clark.